Sure you want be physically fit and healthy, but finding time for a thoroughly effective cardiovascular workout is just plain difficult with your schedule. Besides, you can always get back in shape once you have enough space for a full-size elliptical machine or treadmill. Sound familiar? It’s time to leave excuses behind along with any oversized clothing those excuses have earned you. The Stamina InMotion E1000 Compact Strider eliminates any “reason” to procrastinate about the health of your body and mind. The incredibly compact, portable, and affordable elliptical lets you conveniently work up a healthy sweat nearly anywhere, anytime. Ever wonder why elliptical machines are so often occupied at the gym? Elliptical trainer workouts are proven to burn a similar number of calories as jogging does, efficiently increasing stamina and energy while toning your hips, buttocks, thighs, and legs. Unlike jogging, however, ellipticals help you reach your fitness and weight loss goals through a low-impact routine that won’t jar your back, knees, hips, or ankles. The Stamina InMotion E1000 Compact Strider offers the all results without the endless membership fees, crowds, and hassle of driving to the gym. The Stamina InMotion E1000 Compact Strider is designed for easy portability and complete convenience. It’s compact and lightweight enough to take anywhere, so you can fit your cardio workout into your daily schedule with no problem. With non-slip pedals that hold your feet in place without a second thought, you can enjoy the low-impact, joint-friendly exercise while your mind is focused on work. Use the E1000 Compact Strider at home or at the office, and when you’re finished, you can store it out of sight and out of the way – under your desk or in the closet. 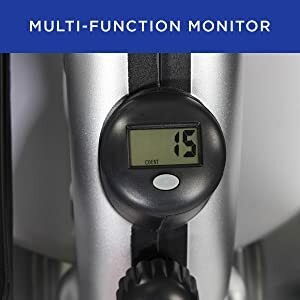 The Stamina InMotion Compact Strider can be used sitting, standing or by pedaling in reverse motion, making it easy to get a convenient and versatile workout. Exercise on the Stamina InMotion Compact Strider helps you burn calories, tone lower-body muscle and improve your cardiovascular health, all in a joint-friendly manner. Whether you’re watching television, reading a book, or working out at the office, this compact strider can go wherever you go. Because the multi-functional monitor tracks your progress, you’ll be further motivated to continue pedaling. It also has a scan function so you can see all your workout stats periodically. 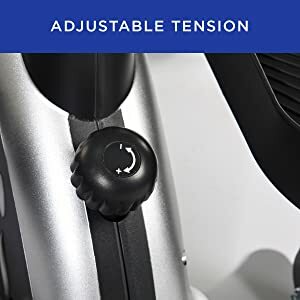 Control the intensity of your workout by simply adjusting the tension knob. Even more, the resistance is quiet so you can do other things. 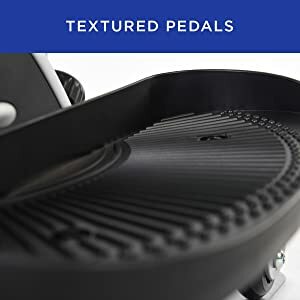 No matter how you use the strider, the textured surface of the pedals will secure your feet so you can pedals as hard and fast as you want.